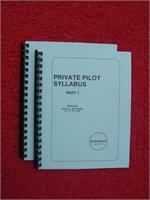 Skyroamers® training syllabi are comprehensive publications—not brief training outlines—that flight instructors use for student training. Use the Links prompt on the home page to view sample lessons. 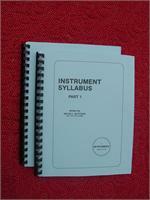 Each syllabus consist of two parts. The student keeps part one. 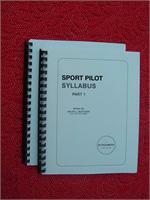 It contains an explanation of syllabus nomenclature; a lesson summary with study assignments; a supplementary ground instruction outline; cross references for the numbers and communication procedures listed in the AIM and CFRs; and the written examinations for presolo and each stage of instruction. The supplementary ground instruction outline lists the regulations, procedures, and general information that should be studied during each stage of instruction. The numbers and communication sections summarize information that must be memorized. Each lesson represents a specific learning objective, not a flight time objective. Student proficiency is the goal. Many lessons contain instructor teaching tips, a feature that helps flight instructors master Skyroamers® training objectives. 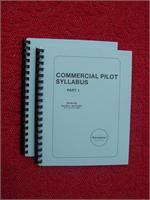 All syllabi are designed to include training in advanced technology airplanes (glass cockpits, GPS, and fiber-composite construction). That is accomplished by included optional lessons when it would be appropriate for that training. Advance technology does not make previous basic training requirements and principles obsolete. Those factors must be mastered first and foremost. To obtain a sport pilot certificate — airplane. To obtain a multiengine rating—airplane multiengine land. To obtain a basic flight instructor certificate—airplane single-engine land. To add an instrument rating to a basic flight instructor certificate. To add a multiengine rating to a basic flight instructor certificate.